For details of the AGM presentations please click this link for the Powerpoint presentation (8Mb). Includes All Abilities Path and #TeamHamish Phase 1a. I am very happy to report that I am now seeing a positive way forward. We must work with the new C/E at Highland Council and we are really pleased to have Donna here tonight. I want you all to leave this meeting seeing a clear strategy to deliver what I believe we all want. What do we want? Nairn and Nairnshire to be recognised as a centre of innovation and development. NICE has been working hard to build the necessary relationships to allow us all to work together. We have always argued that Nairnshire is a great place to stay and to holiday in. But it needs investment and support. We want to see more and better local jobs. We want to see a green sustainable future. So, what have we been working on? 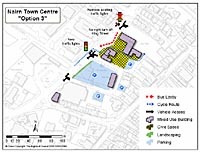 Firstly, we were asked to help deliver the BID (Business Improvement District). This is now up and running. You will all be able to enjoy their first event-TASTE OF NAIRN this weekend. Can I urge as many of you as possible to attend the various events? Michael Boylan and his fellow directors will deliver. More footfall, more jobs and above all more good publicity for Nairnshire. Already we are seeing very positive support from our excellent business sector and much more joined up thinking. Add to this -a fantastic Community Centre , the sports club , our 2 great golf courses and the integrated community hospital teams then we really do have some very good foundations to build on. Team Hamish will also deliver their exciting vision for Nairn. They have won National awards and recognition for their plans. But above all you have responded in the most positive way. Most importantly with your support and help whenever needed. Also, your amazing financial support and generosity. We now have clear way forward and with matched funding will deliver some great improvements for next year. Making sure 2020 will be a great time to be in Nairn. We have delivered the re surfacing of the all ability path allowing access to the east beach. This is the ideal model of how joined up working delivers what we all want. There is a lot of interest in The Common Good at present with the Community Empowerment Act. I would like you all to think about the River Nairn, the Maggot, the Dunbar Golf Cub, Park dean Caravan site, the harbour, the links and Sandown. They are all in our Common Good. They are worth their weight in gold as the essential components of our environment and green sustainable future. They form the basis for our major tourist attractions. That is before we even start to put any financial ticket on them. We owe it to all the previous generations to get this right now and build on this amazing legacy. Tonight, you will see how far down the road we have come. Yet the future looks better every day. We have now found the one voice we were asked to deliver. Can you all continue to support and help in any way you can. Nairnshire will be an even better place to live and holiday in. Report on establishment of Business Improvement District. Report on East Beach Path Restoration. Report on #TeamHamish and Plans for the Links. Members are encouraged to appoint a proxy to vote on their behalf if they are unable to attend in person. The appointment of a proxy may be done by replying using the form below and should be received by the Company Secretary by 7.00 pm on 9th April 2019. DATED this 19th day of March 2019. 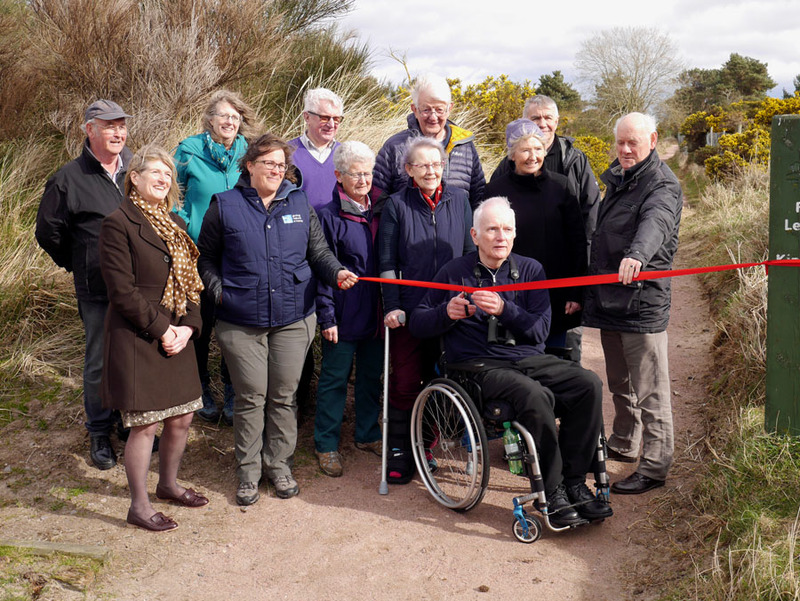 A small opening ceremony took place this week to celebrate the restoration of the very well used path from Nairn East Beach car park to Kingsteps.The path, on Common Good land, leads to the edge of the Culbin nature reserve and was made all abilities around fifteen years ago in association with the Nairn Access Panel. Since then it had become encroached upon and very worn due to its popularity and could no longer provide access for wheelchairs, buggies, or those unable to negotiate the narrow, wet and bumpy conditions. Nairn Improvement Community Enterprise and Nairn Access Panel teamed up to obtain grant funding of £18,500 for the project from the Landfill Communities Fund, RSPB, Nairn Access Panel, and Nairn Ward Discretionary Fund to restore the path, and the work has been done to a high standard by Highland Conservation Ltd. While following national policy to encourage outdoor access for all with the health benefits it brings, it is really rewarding to see locals and visitors of all abilities enjoying once more the wonderful landscapes, birdlife and photographic opportunities which this route provides.It’s also a very good example of how NICE can work with community groups to provide the structure and support to bring ambitious local projects to fruition. East Beach to Kingsteps all abilities path restoration. Work will be undertaken in February to restore the all abilities path from the East Beach car park to Kingsteps. The path, on Common Good land, leads to the edge of the Culbin nature reserve and was made all abilities around fifteen years ago in association with the Nairn Access Panel. Since then it has become encroached upon and very worn due to its popularity. It can no longer provide access for wheelchairs, buggies, or those unable to negotiate the narrow and bumpy conditions, and water pools in the hollows. Nairn Improvement Community Enterprise has now worked with the Access Panel to obtain grant funding of £18,500 for the project from the Landfill Communities Fund, RSPB, Nairn Access Panel, and Nairn Ward Discretionary Fund to restore the path, and a very experienced contractor Highland Conservation Ltd. has been appointed. For health and safety reasons this will clearly cause some inconvenience to regular users as the construction work is undertaken, but diversions to alternative routes will be clearly marked from the car park when necessary, and there will be no problem with access to the beach or dunes. While following national policy to encourage outdoor access for all with the health benefits it brings, it will be really rewarding to see locals and visitors of all abilities enjoying once more the wonderful landscapes, birdlife and photographic opportunities which this route provides. ON Friday 14th a wide range of community groups and organisations met with Donna Manson, the new CEO of Highland Council. The objective was to outline many of the issues that have been of concern to many in Nairn. The new CEO has expressed a desire to hear from communities and expressed a genuine desire to work with them in ways that may not have happened previously. It was a very positive meeting. You can see a copy of the presentation here. Over the years many ideas have been offered, but unfortunately these have not been brought to fruition. We would suggest that previous proposals have lacked a holistic, overarching strategic master plan that encompasses all of Nairn’s assets and highlights their potential. Similarly, full collaboration between community bodies, voluntary groups, local businesses and the statutory authorities has been overlooked. This has resulted in there being limited ‘joined-up’ thinking to put Nairn back on the map as a tourist destination and revitalised for the benefit of its Community as a whole. 1. To receive and consider the accounts of the Company for the years ended 30 November 2015 and 30 November 2016. Few in the community of Nairn can be unaware of the story of Hamish Hey, taken from his family and a supportive community much too early in his young life. In order to bring this vision to reality, Hamish’s parents, Sam and Susan, have joined the Board of NICE as Director’s. This relationship provides an organisational and legal structure, charitable status – and a bank account, that allows Team Hamish to function and develop its vision. We look forward to working with them.